Introducing the VENTS VK DUO industrial supply and exhaust fan for round air ducts. 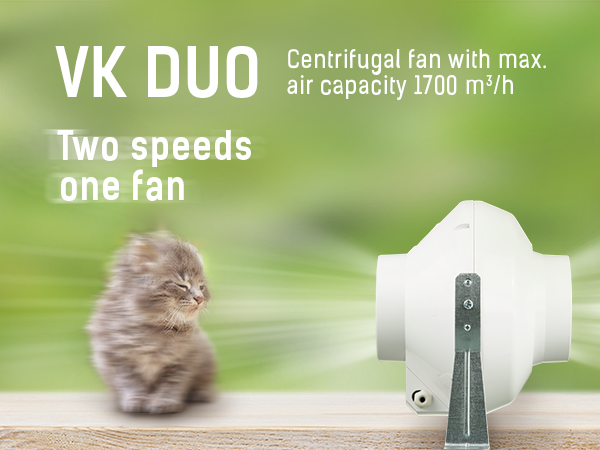 The VENTS VK DUO series fans are equipped with two-speed asynchronous motors and dynamically balanced centrifugal impellers. The addition of two-speed motors to the VENTS VK series has resulted in an overall fan performance increase and helped improve air flow control per space. More accurate air flow control has practically eliminated excess power consumption. That being said, the total energy consumption of the VENTS VK DUO fans is lower compared to the conventional models by an order of magnitude. Step-by-step speed control is provided by P2-10 switches. The fan can handle both air supply and air exhaust duties depending on the user’s needs. The plastic casings of the VENTS VK DUO fans are made of non-corrosive plastic perfectly suited for spaces with elevated humidity levels. The series includes a variety of modifications with electronic thermostats which enable automatic response to temperature changes. The VK DUO series fans are also available in configurations with external temperature sensors and an in-duct thermal sensor. This option is particularly useful in greenhouse applications as the impeller rotation speed changes automatically depending on the changes in temperature in the serviced space or the ventilation duct. As a result, the unit maintains the necessary temperature without operator intervention. The fans are available in a wide range of standard sizes from 100 to 315 mm. The VENTS VK DUO series of fans takes supply and air exhaust ventilation to a whole new level of versatility and convenience. Simple installation adaptable to a variety of applications, a wide range of options and two impeller speeds ensure excellent occupant comfort and secure the fan a very special place in the company’s product line-up.